GET IN ON THE BIGGEST SECRET IN TRADE SHOW AND CONVENTION MARKETING! WE ARE THE IDEAL MARKETING TOOL TO HAVE IN YOUR EXHIBIT BOOTH – YOUR PRODUCT, YOUR BOOTH, OUR MISSION. We offer top of the line entertainment and promotional services to convention vendors. Hire TheShoeShine.com to attract attendees into your booth, improve product visibility, and facilitate sales! DO YOU WANT TO BEAT THE COMPETITION AT CONVENTIONS? Businesses spend thousands on exhibit booths at trade shows, conventions, and conferences to promote their products and increase sales. This often yields little result because businesses fail to make a personal connection with the attendee. A personal connection is worth millions. We help make that personal connection on the convention floor. With this positive, personal experience attendees remember your company, and your product. No amount of swag can create that, but TheShoeShine.com can. HOW WE MAKE THE NEEDED ‘PERSONAL CONNECTION’ TO ATTENDEES IN CONVENTION HALLS. Marketing in a convention atmosphere is very different from selling in the field. Large convention halls can often be scary, overwhelming places making it difficult to connect with attendees. You have only about 10 seconds or less to get the passing attendees attention and qualify them! We place our shoeshine chairs in your exhibit booth. Our attractive, experienced personnel stand in the aisles prospecting and qualifying every passing attendee. Potential new customers are moved effortlessly into the booth and onto the shoeshine chairs. Once in the chair your sales people can make that personal connection and discuss your product. We have proven it by delivering concrete sales results. Trust our 15 years of face-to-face experience getting qualified attendees out of the aisles and into your booth. We at TheShoeShine.com have been successfully connecting with attendees, promoting products, and increasing sales at exhibit booths since 1996. Our clients include Yahoo!, Avatier Corp., Caris Lifestyles, Levi Strauss, Nationwide Insurance, Capital IQ, Eukanuba, and many more satisfied customers. These businesses have attributed sales increases in the millions to our service. At your next convention at Moscone Center or any location nation wide, hire us to shine shoes with a chair massage in your exhibit booth to attract attendees, qualify them immediately and move them along quickly if they are not a serious prospect. Want to see what's happening at the Moscone? 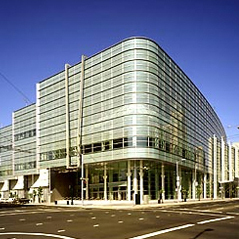 Check here for upcoming events at the Moscone Center! © 2019 Moscone Shiners. All Rights Reserved.